VIP To Go is the premiere provider of portable restrooms luxury trailers. But one of the questions that we often hear at VIP To Go is about whether we have affordable restroom trailers for non-money making events, such as family reunions or executive meetings. The answer is, yes, of course we do. At VIP To Go we strive to meet your needs. Sure, we are ready to rent the top of the line, portable restrooms luxury trailer to the wedding of the century. But we also want to be an important part of your wedding, reunion or other family event. We know that in our families a dollar needs to stretch a long way, and we know the same is true for you as well. But we also know that clean waste management facilities are important. That is why we offer a simple, but still 5 star, fully loaded portable restrooms luxury trailer with water, lights and air conditioning for just over $900 – this is one of our “best sellers”, and sure to make your party more comfortable for everyone. This price is, of course, subject to change (it was accurate as of early 2014) and varies based on your location, duration of rental, and size of your party, but it gives you an idea of where you stand before you even call. At VIP To Go we know that price is part of the value that we bring to you, and that is why we strive to provide affordable options. But we also know that price is not everything; customer service is an important part of getting what you need. And at VIP To Go we offer the best customer service possible with each portable restrooms and luxury trailers. Our philosophy, and what we teach our entire staff, from phone operators to sales staff, delivery drivers and more, is that we are not in business to complete this one sale that we are working on. Instead, this sale is just a test run to allow us to show you how great VIP To Go is, and to encourage you to come to us the next time, and to refer us to friends. This philosophy helps us ascertain that you always get our best service, every time. Can you set the Restroom Trailer up for me? Do you charge extra for delivery, set-up, tear-down or pick-up? Will the trailer require me to do any maintenance? Does the trailer come stocked with paper products? How many electrical outlets will I need to have nearby? How much the trailer cost, and how many days will does that cover? Once you have the answers above, you will be prepared to make the decision that is right for you and choose your rental company. One thing you may wonder is whether VIP To Go rents small blue box restrooms. 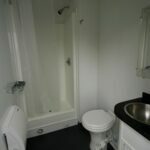 The answer is that VIP To Go believes in doing one thing and doing it well – we rent restroom and shower trailers only. However, we do have relationships with other companies and can provide you with a referral if you truly feel that a blue box chemical toilet is best for your event. For more information about our rental restroom trailers browse our website or call 877 564 6977. Restroom trailers are an affordable, attractive and safe option for any sporting or education event, from open houses to hosting the opposing team. When you need temporary restroom facilities a toilet trailer rental gets it done without plumbing lines or drains. When it comes to renting portable restrooms for your event, we know that you have a variety of options. In this section we will discuss more about why restroom trailers are far superior to the old blue box chemical toilet. We will also discuss the costs and luxury of a Restroom Trailer, as long as the impeccable service that VIP To Go can provide it for you. Please first like our Facebook page by clicking on the following button. Once you are done, Download button will automatically appear. Thank You very much for liking our Facebook page! You can now download the PDF of our guide book by clicking on the following link. Follow the link from the right, contact us and we will come with an offer in no time. We are a nationwide company serving your area! We are slowly rolling out our upgraded buying platform where you will be able to complete your booking conveniently online. Please Input what are you planning for ? Please Input Nr. of persons ? Please Input Start Date ? Hey! Sorry, we cant book you online for the dates requested for this trailer, Please send us a Quote and we will get back to you on this. Dear customer, The rental dates you have selected are within the next 48 hours. In order to assure that we can meet your request, please give us a call at 877 564 6977 or email us at info@viptogo.com. Hmm, We currently can't quote pricing for our long term rentals on the website. Please shoot us a quote request and you'll receive it in your inbox by tomorrow. Or take a look through our portfolio and request a quote for specific trailer. Oops! It looks like we can only provide a quote in your areas for rentals longer than six weeks. However, we aim to serve you, so send us a quick email, and we'll be sure to help you find the best solution. Hmm, We currently can't quote pricing for our long term rentals on the website. Please shoot us a quote request and you'll receive it in your inbox by tomorrow. Or take a look through our portfolio and request a quote for specific trailer. Please enter your temporary password to proceed.